Furuno’s FCV-628 is a dedicated 600W Fishfinder producing exceptional Sonar Imaging. Designed with RezBoost Technology, the 628 increases resolution and enhances target separation when paired with a narrowband transducer. Added features such as Bottom Discrimination and Accu-Fish come standard in this affordably priced Fishfinder. 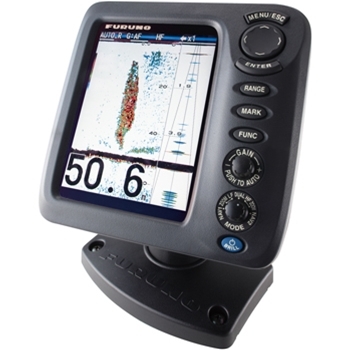 Furuno's FCV-628, 600W fishfinder offers a 5.7” high resolution color display. Offering some of the most innovative technology in production today. The FCV includes high end features such as “Bottom Discrimination” which actually indicates if the bottom is composed primarily of rocks, sand, gravel or mud, providing valuable information to help you locate rich fishing grounds and boost your catch of the day as well as “Accu-Fish”, which will show actual fish size on the individual fish echo on-screen. This feature will greatly enhance your ability to identify fish targets on the display. Furuno’s RezBoost Sonar Technology offers unparalleled clarity and target separation that the most well know of competitors can’t compete with. RezBoost is a revolutionary new signal processing technology that Furuno invented which achieves CHIRP-like performance from your traditional 600w or 1kW Transducers. The FCV628 offers up to 8 times the target separation than its predecessor the FCV627. Furuno’s FCV628 600w sounder utilizes their FDF (Furuno Digital Filter) technology, and auto adjustments technology, which helps adjust gain, clutter, and output power. This makes the picture clearer and easier to decipher between baitfish and larger target species. The FCV628 also offers 50/200 frequency capability which will give you options whether running in deep water or at higher speed. The 628 offers a high resolution display which shows underwater conditions in 8, 16, or 64 colors for a brilliant picture. The FCV628 is waterproof which allows it to be installed on any bridge or center console. Audio and visual alarms alert you whenever preset limits are met for water depth, water temperature and fish echoes. Of course the FCV628 offers selectable automatic fishing and cruising modes to match your needs for the day. The FCV-628 is a high end stand alone fishfinder providing exceptional underwater images at an affordable price point. THE TRANSDUCERS LISTED BELOW WILL PROVIDE BOTTOM DISCRIMINATION AND ACCU-FISH. OTHER TRANSDUCERS MAY NOT, PLEASE CONTACT THE GPS STORE AT 1-800-477-2611 FOR HELP CHOOSING A PROPER TRANSDUCER. MB1100 MATCHING BOX REQUIRED WITH 1KW TRANSDUCERS BELOW. Bottom Discrimination feature distinguishes bottom composition and displays either rock, sand, gravel or mud. Accu-Fish - Unique Fish Analyzer determines length of fish in inches or Cm. Furuno 525TLTD20, B60-20 Low Profile Bronze Thru-Hull Transducer with 20 degree tilted element and temp. Designed to works on boats with deadrise between 16-24 degrees. Does not need Fairing Block. 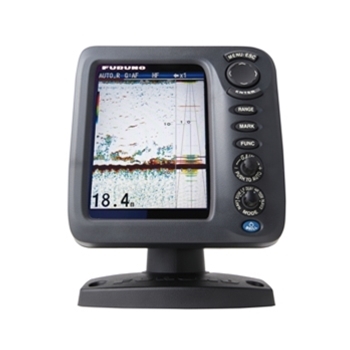 Furuno’s FCV588 with RezBoost Technology offers a bright, 8.4” color display that will clearly display fish and bottom composition. A 600/1kW Sonar, Rezboost improves resolution and enhances target separation when paired with a narrowband transducer.